Bird-Boxes.co.uk manufacture Bird Boxes in the UK. 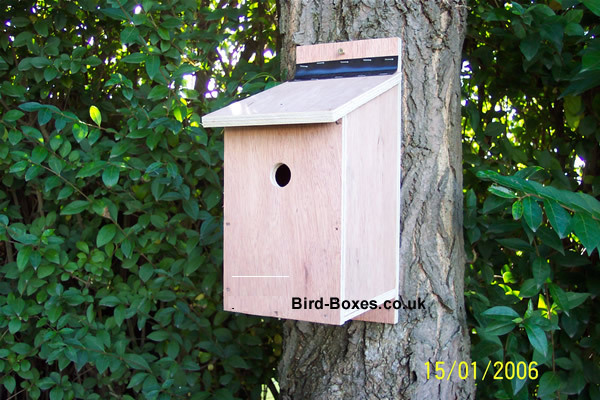 These Bird Boxes are designed and made by ourselves to exceed RSPB & BTO guidelines, 15mm exterior grade ply is used for our bird boxes because its the best material to use. Simply designed, all our Bird boxes have drainage holes to keep the inside dry, polyethylene hinges to keep out the rain, top opening to aid out of season cleaning and sealed joints to keep out the draughts. Our Bird Boxes are not treated, you can of course treat the outside of your bird box but evidence suggests that garishly painted bird boxes actually deter occupancy, our bird boxes will last a considerable time without treatment. Clean your Bird box out and use boiling water to disinfect it. Once erected your Bird box might not be used in the first year.......don't worry !